With Halloween over, today is traditionally the day that the Christmas decorations come out, so it is appropriate that an iconic animal associated with the festivity is getting a jump on the holiday spirit by joining the list of species to have its genome sequenced. 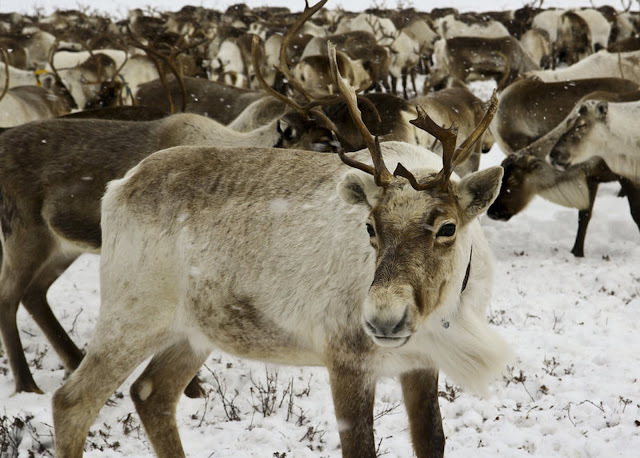 Published today in the open-access journal GigaScience, is an article describing the sequencing and analysis of the reindeer genome. This work, although unlikely to reveal why Santa's reindeer can fly, provides a great resource for gaining greater understanding of the processes of evolution, domestication, animal husbandry, and adaptation to extreme environments. The reindeer (Rangifer tarandus) is the only fully domesticated species in the deer, or Cervid, family. It is also the only deer that has a worldwide distribution: spanning boreal, tundra, subarctic, arctic and mountainous regions of northern Asia, North America and Europe. Unlike all other cervids, it is not just the male deer that grow and shed antlers, but also the females. From an animal husbandry standpoint, reindeer milk is far richer in protein and has less lactose than cow's milk. The latter aspect makes the availability of this milk of interest given the high percentage of lactose intolerant people in the world. With this variety of unique features, the availability of a reindeer genome sequence can provide an entire sleigh-full of new information, and is a welcome new member to the elite club of domesticated species with reference genomes, including the cow, sheep and goat. This work was carried out by a team of Chinese researchers from the Chinese Academy of Agricultural Sciences in Changchun and the Northwestern Polytechnical University in Xi'an. The researchers took a blood sample from a two-year-old, female reindeer of a domesticated herd maintained by nomadic Ewenki hunter-herders in the Greater Khingan Mountains in China. They sequenced, assembled, annotated the genome and showed it was of high quality. Comparison of the reindeer genome to the genomes of related species and to humans, revealed that the reindeer genome size (2.6 GB or 2.6 billion base pairs) is slightly smaller than that of humans, cows, and goats, and about the same size as sheep. The paper's first author, Zheping Li, associate professor at the Institute of Special Animal and Plant Sciences at the Chinese Academy of Agricultural Sciences, noted that the analysis also identified "335 reindeer-specific genes that are likely to aid in understanding the special biological characteristics of reindeer. These could also be very useful in understanding the evolution of the reindeer as well as the entire Cervid family in future comparative genomics studies between reindeer and other ruminants." With this goal in mind, the researchers also constructed an evolutionary tree using the new genome and the already available genomes of members of the bovine family. They found that reindeer, cattle, and goats separated from a common ancestor approximately 29.6 million years ago. This was during the Oligocene epoch where one of the major changes was the global expansion in grasslands. This article was one of the winners of the inaugural GigaScience competition and prize track that is used to promote new, cutting edge, research. The authors presented their work in a special session at BGI's 12th annual International Conference on Genomics in Shenzhen on Friday 27th October. As an open-science competition this and the other winners' articles were reviewed in a fully open manner, where the public could follow the entire publication process from having the draft article openly available in the Biorxiv pre-print server, the peer review process done live with reviews made available prior to publication decision at the Academic Karma overlay review system, followed by editorial decisions, manuscript revisions and article publication with all editor, author, and reviewer correspondence made available with the published article.